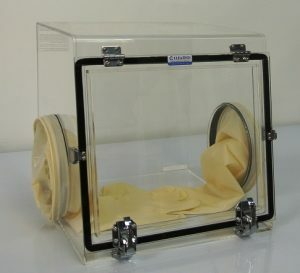 Compact glove box is a portable sealed enclosure that is designed to allow one to manipulate objects where a separate atmosphere is required but in a small scale. It can used in mail handling, labs and clean rooms. The operator can place their hands into the gloves from the side ports and perform tasks inside the box. Transparent construction allows the user to see what is being manipulated. These glove boxes feature large tilt-up front access door provides convenient viewing and accessibility. Available with optional gas ports for application required Inert atmosphere. CDA or Inert gas such as nitrogen, argon can be used to control the oxygen and humidity level. 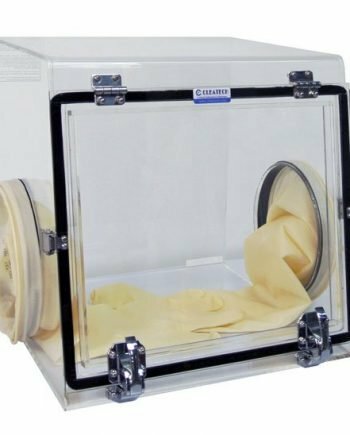 Available in cleanroom-safe materials including clear Acrylic, Static dissipative PVC and polycarbonate. Material Guide Video! 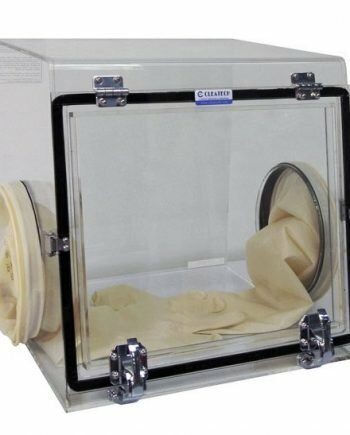 * Chemical Grade Clear Static-Dissipative Acrylic Compact Glove Box with static dissipation technology on the construction material which prevents electrostatic charge generation on the surfaces, It does not attract contaminants, helping prevent contamination in ultra-clean manufacturing operations. It has a powerful chemical resistant. (e.g. no effect against Alcohol, Sulfuric Acid and Sodium Hydroxide 30%, Ethanol). Digital Hygrometer / Thermometer 15% to 99% RH , 14° F to 140° F Temp.